Telford 50 - What's Next? 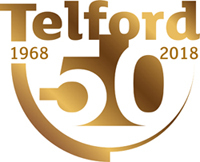 The most important part of the Telford 50 celebrations is the lasting benefit we want it to have across the borough. The £2m Telford 50 Legacy Fund supports a mix of physical schemes as well as other projects that improve the borough for residents and visitors, while also helping to reduce demand on Council services and address some key social issues. The allocation of the £2m Telford 50 Legacy Fund is based on project themes people want to see as lasting legacy of the anniversary. Almost 1,400 people took part in a consultation in summer 2017 and some of the most popular themes people voted for include heritage, tourism, arts and culture. This section on website provides information on Telford 50 Legacy projects and their progress and we’ll continue to update it regularly.